It is just below the humble church and monastery of the Order of the Capuchin Friars, where the mortal remains of the rulers of the Habsburg empire are laid to rest. A tour through the Capuchin Crypt takes you through 400 years of Austrian and European history, from the Thirty Years' War to revolutions and the first ideas for a united Europe. 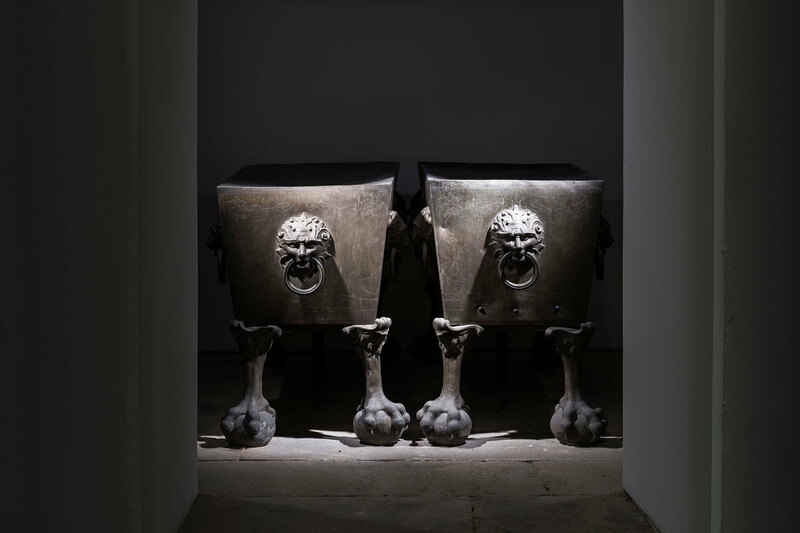 The greatest artists of their time designed the rooms, symbols of power on the sarcophagi bear testimony to the dynasty's imperial claim. Signs of transience and faith reflect personal trust in God and humility before their Creator. However, it is the human fate behind the offices, the triumphs and defeats which are ultimately moving. 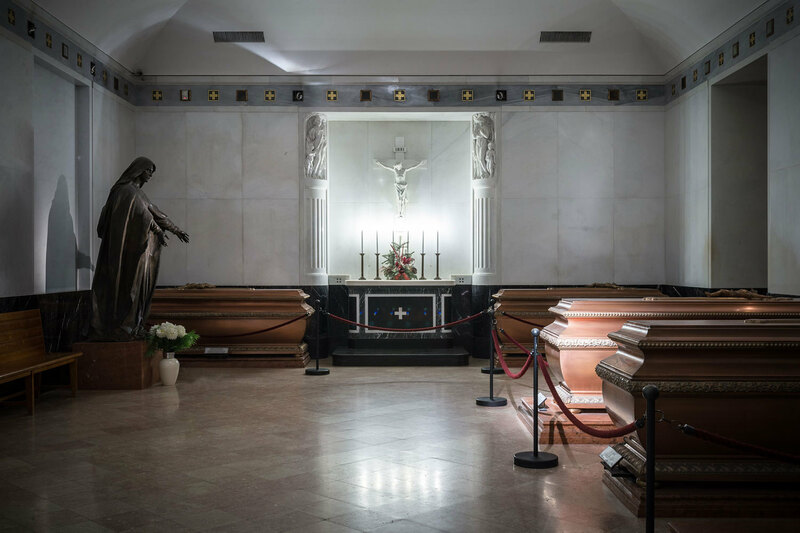 Today, the mortal remains of 150 Habsburg personalities rest in the Capuchin Crypt. Daily 10 a.m. - 6 p.m.
Groups: + € 3,-- p.p. We accept „Vienna City Pass", "Vienna Pass" and „Flexi Pass". Please let us know the desired date and possible alternatives for your visit. 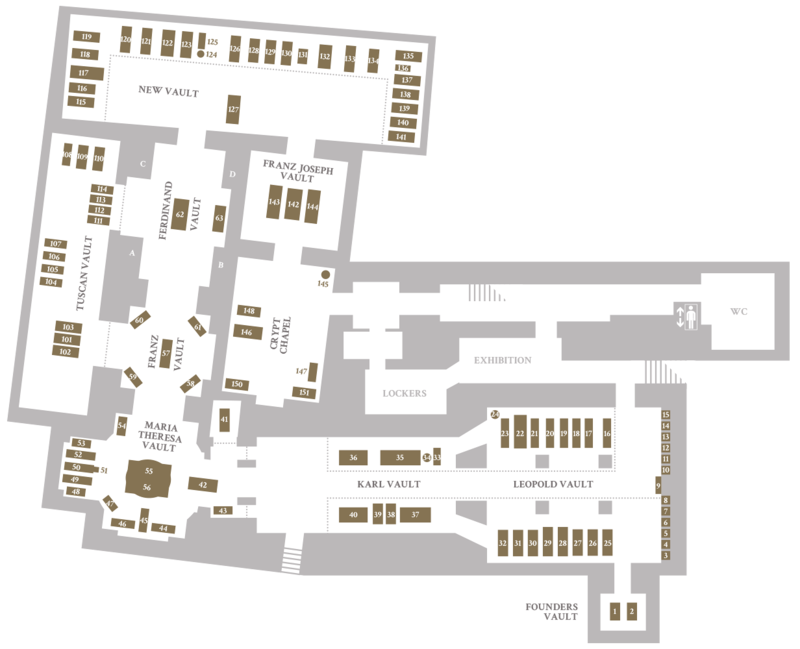 Let us know if you have your own guide or if we can organize a guided tour for you. German, English, Spanish, Italian and French. Please note the above conditions regarding group visits! – If your agency regularly handles visits for groups in the Capuchin Crypt, we will be happy to inform you about the billing options via vouchers. We would be pleased to inform you about our prices for tour operators on request. Send us your request via mail. Journalists who visit the Crypt in the exercise of their profession are offered free admittance, if they register at least three days in advance. We expressly point out that you need an extra permission for the publication of photos or film scenes! Within the scope of our possibilities we will support you in your work in the best possible way. For centuries The House of Habsburg, the former ruling family of Austria, played a leading role in Europe, controlling the history of the country for almost 650 years. With a skillful marriage policy, the Habsburg dynasty secured territorial expansion, the rise of great power and political influence on European royal courts, including France, Portugal and Spain and their colonies on the American continents, in the Pacific, Africa and Asia. At the height of its power, the territory of the Habsburgs expanded into a worldwide empire in which literally "the sun never set." Since 1618 the Capuchin Crypt in Vienna has been the family burial vault of the Habsburgs - a monument and symbol of sovereign power, which clothed its own impermanence with beauty. 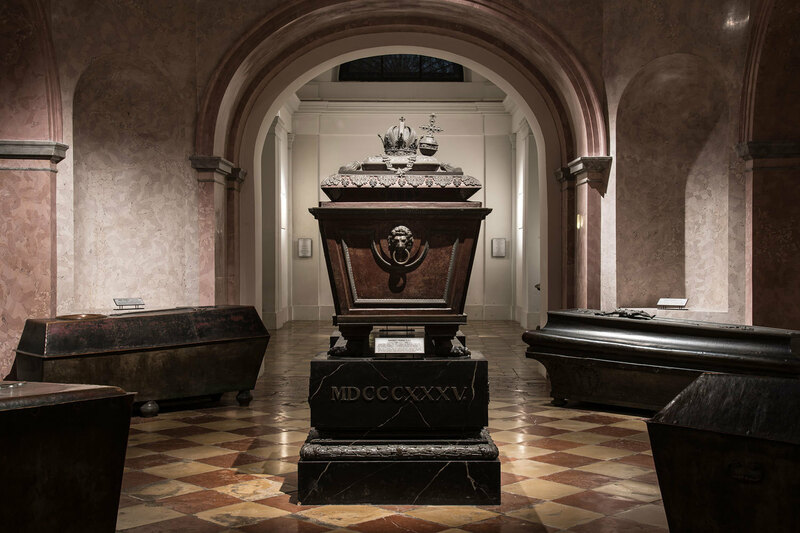 To this day, in their last residence under the custody of the Capuchin Order, the remains of 12 emperors and 19 empresses and queens from the house of Habsburg and their family members are resting here. Multiple extensions and modifications over four centuries extended the crypt to a total of ten vaults, which now hosts the sarcophagi, urns and funerary monuments of the Habsburgs. The Capuchin Crypt reflects the spectrum of its human destinies and preserves the glory of former greatness in death. 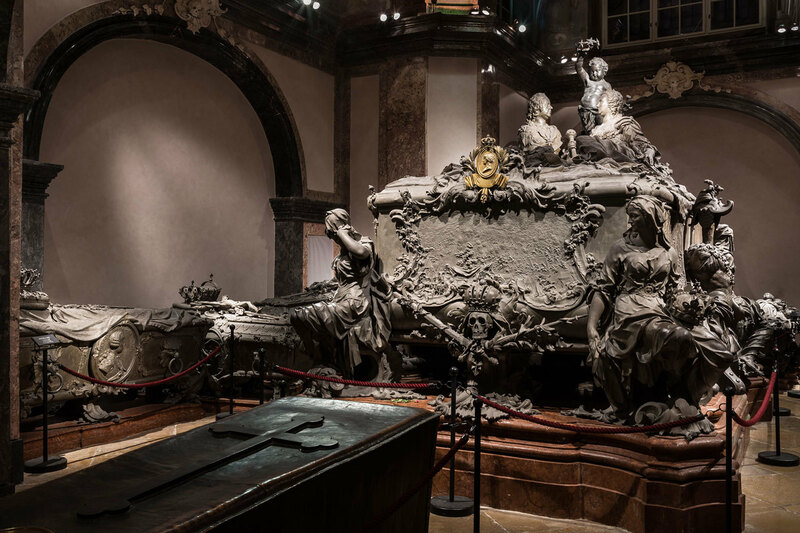 In this way the Imperial Crypt is one of Vienna’s top sightseeing attractions to discover the Habsburgs family history from a different point of view. By the way: The 19 degrees air-conditioned Crypt is one of the best places to escape the summer heat in Vienna.